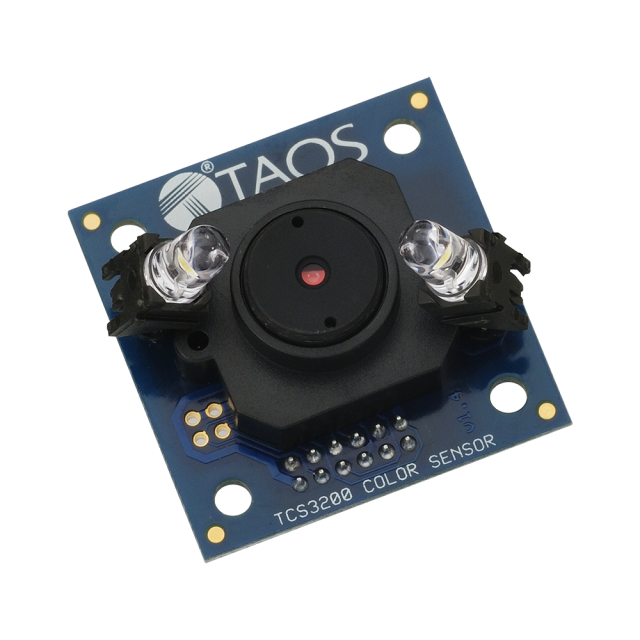 "TCS3200 color sensor & EMIC 2." TC3200 Color Sensor Product Document. Daughter Board BASIC Stamp Programs. TC3200 Color Sensor Match Source Code. TCS3200 Color Sensor Daughterboard is a complete color detector, including a TAOS TCS3200 RGB sensor chip, white LEDs, collimator lens, and standoffs to set the optimum sensing distance. It plugs directly into the BASIC Stamp-2pe Motherboard orPropeller Backpack and will also interface to any other BASIC Stamp module or Propeller board using the optional DB-Expander SIP Converter. The TCS3200-DB can detect and measure a nearly limitless range of visible colors. Applications include test strip reading, sorting by color, ambient light sensing and calibration, and color matching, to name just a few. 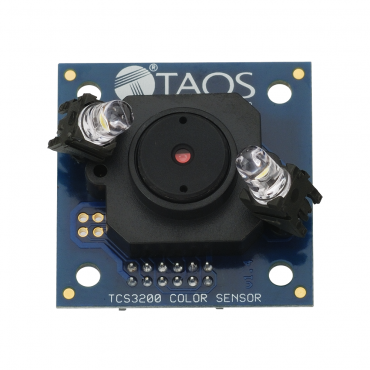 The TCS3200 has an array of photodetectors, each with either a red, green, or blue filter, or no filter (clear). The filters of each color are distributed evenly throughout the array to eliminate location bias among the colors. Internal to the device is an oscillator which produces a square-wave output whose frequency is proportional to the intensity of the chosen color. Read the documentation below and check out the Color Matching Demo for more detailed information. Focusable lens provides a sharply-defined field of view. Two current-regulated white LEDs for illumination. Onboard white LEDs can be gated on and off for ambient light subtraction. Ambient light sensing and calibration. Module is is plug-combatible with Parallax motherboards. Sensor provides a readout of individual RGB color components as a digital frequency. Module can run from 3.3V or 5V logic supplies, plus 5V for the LED. Power requirements: 5.0 VDC for LEDs; 3.3 VDC or 5 VDC for logic. Communication: parallel RGB addressing; frequency output for color data. Dimensions:1.35 x 1.35 x 1.18 in (35 x 35 x 30 mm). NOTE: The TSL3200-DB includes white LEDs, lens, screws, and standoffs.